1.Printer's Devilry - P.D. : Each clue is a passage from which the printer has removed a hidden answer, closing the gap, taking liberties sometimes with punctuation and spacing, but not disturbing the order of the remaining letters. Thus, in the sentence Now that it's so much warmer, cant I let the boiler go out? MERCANTI LE is hidden; the printer might offer, as a clue: Now that - it's so much wart, the boil.. ergo, out! Each passage when complete, makes sense. 2. Playfair - Pl. : In a 'Playfair' code-square, letters of key-word, in which no letter recurs, precede rest of alphabet in order: I does duty for I and J. To encode a word, split it into pairs of letters thus: BR EV ET ED. If letters of a pair occur in same rank in square, use letters to right of each (for last letter of rank use first letter); if in same column use letters below each bottom letter of column use top letter): otherwise treat them as limits of diagonals of a rectangle and use limits of opposite diagonals (ET = DU, not UD, which = TE). Result: AB HB DU SF Then join into one word AB HB DU SF. 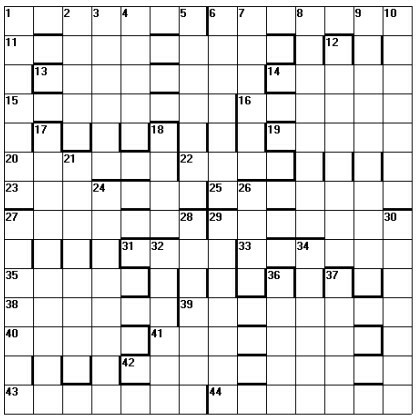 Answers are to appear in diagram in code, according to a code-square with a key-word which has to be discovered. Most of the letters in their encoded forms can be found from interlocking words. Comparison of these with their letters in their normal forms yields some code equations, from which the code-square used is to be deduced; remaining squares then to be completed. 3. Wrong Number - W.N. : Each clue includes a one-word definition the word required at the number where it stands but belongs as a whole to a word of the same length elsewhere. Method recommended is to find, after solving a clue, a definition of the solution in one of the three other clues to words of its length; this will show where the word is to go. 4. Definition and Letter-mixture - D.L.M. 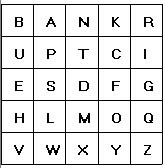 : Each clue includes both definition - one word or more - and a mixture of letters of required words beginning with the beginning or ending with the end of a word in the clue. 5. Misprints - M.: One letter only is misprinted in the definition part of each clue, none in diagram. 6. Right and Left - R.L. : Each clue is really two clues, not overlapping, to two words, one for left side of diagram, one for right: either may be clued first. 7. Theme and Variation - T. V.: The theme-words are a well-known married couple: the two A' variations are both related to A in the same way; so are the two B variations to B.